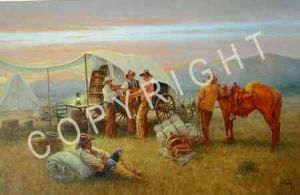 The chuckwagon was the cowboy's home away from home while out on the long and often lonesome cattle drives. Many times after a long day's work the men would gather around the wagon with a guitar and fiddle to pass the time. These early cowboy ballads were the roots of the music we know as "Country and Western."